To begin my quest for a full bodied fruit-based red wine, I'm first going to to a retro-assessment of my previous attempts. The entertaining tale of my 2006 Blueberry wine batch is a couple of posts below. 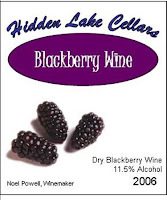 I also made a 2006 Blackberry wine that I tried the first bottle in late Dec 2007 after aging for 12 months. Appearance: Clear light orange-garnet. I can see through the glass. Aroma: Blackberries (duh! ), lightly sweet on the nose, hints of vanilla. Taste: A lot like it smells. Initial fruity burst, some tannin on the back of my tongue, but not a long finish. It comes and goes pretty fast. The frozen blackberries were thawed by pouring 1 gal of boiling water over the fruit and mashed. After addition of 1.25 gal water, pectic enzyme, tannin, and yeast nutrient, Brix = 5 (SG = 1.015, PA = 2%), so 6 lbs sugar was added to reach Brix = 21.5 (SG = 1.086, PA = 11.5%). The TA = 0.4%, so I added 5 tsp tartaric acid to reach TA = 0.6%. Fermentation was quick and the cap was punched down 2-3 times per day. After 5 days Sg = 1.000, so the wine was pressed (3.66 gal total yield) and transferred to a carboy where fermentation was completed after an additional 8 days. The wine was racked off the gross lees into a 3 gal carboy and a 1 gal jug, which was topped off with water. The wine was racked an additional 2 times over the next 4 months, using the 1 gal jug to top off the carboy. The carboy was treated with 1.5 oz medium toast French oak for 1 month. After aging in the carboy for another 2 months, the wine was bottled. I'm reasonably pleased with the wine, but it's not as full bodied and is lighter in color than I was hoping. The oak added some nice smooth vanilla flavors and structure. I wonder if adding Lallzyme to the must would give better color extraction? This batch was at the 5 lb fruit/gal ratio, and I think I could go higher to get more flavor and body since the TA was pretty low and required a lot of tartaric acid to increase to the proper level. I also wonder about the initial quality and flavor of the fruit--the frozen berries just didn't have as much blackberry flavor as I was expecting. I wonder if canned fruit puree would give more flavor and body? What about malo-lactic fermentation to give some roundness and depth?